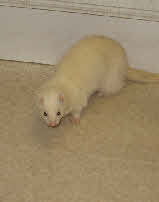 On October 11-2008 I received a telephone call from my local vet’s asking a favour; a small Jill ferret had been found that had been involved in a fight. Reluctantly I offered to take the ferret off their hands, I already had nine ferrets to look after, but instantly I saw her, I was very pleased to be taking her home. 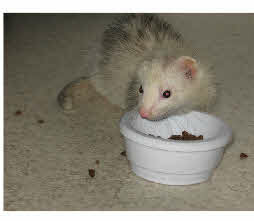 At the vet’s, in a birdcage a small, frightened and very sad looking young ferret, little more than a kit looked at me. As described, there was a large scab covering her right ear and bite marks on her body, she was under weight and I saw she also limped when walking, despite all that she was very tame. At home, she was put on a course of anti-biotic’s and housed indoors in a cage reserved for infirm ferrets. 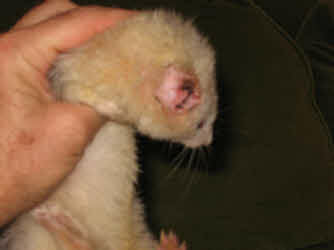 During the first week she gained weight, the wounds healed and eventually the large unsightly scab came away, revealing the reason, an ear was completely missing, probably bitten off by an attacking animal. I realised this sad little ferret had suffered terribly, but had survived and she deserved better. I housed her with Lucy and Ruby, on which she was not keen initially, but eventually they became best friends. Kitty was a friendly, mischievous little ferret. Sadly she was found laying dead in the cage on the morning of 18-12-2011, the cause unknown. There is a tendency for black eyed white ferrets to die suddenly.